Adam King carves traditional and unique lovespoons of his own designs from lime wood (Tilia vulgaris). These designs, which take many imaginative forms, are available for commission. He enjoys creating spoons with personal touches, knowing they will be treasured for many years to come. Adam's lovespoons are very popular and are sent worldwide - ending up in the USA, Australia, Canada and King's native UK. Adam has been carving the spoons for over 21 years, a craft passed down to him by his father, Stuart King. 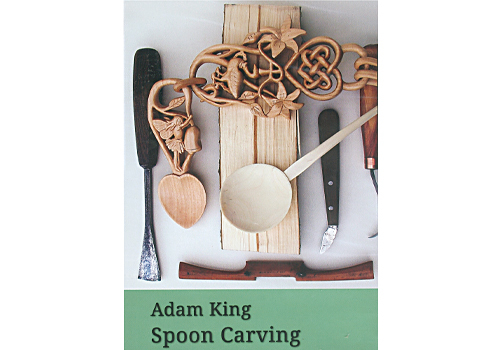 In Spoon Carving, Adam delivers a masterclass on carving your own Celtic lovespoons. This is a DVD packed full of tips and techniques that is just as suitable for beginners as it is for the more experienced carver. This 138-minute DVD features several cameos from well-known lovespoon carvers. These include Britain's foremost lovespoon carver, Ralph Hentall, demonstrating a chain link and figure of eight work. Adam's father - Stuart King - shows you how to make an eating spoon from a freshly cut log using traditional green woodworking techniques whilst Ion Constantin skillfully makes a traditional Romanian spoon in just 10 minutes. This is a fantastic resource for any spooncarvers out there. Adam's passion and huge wealth of knowledge for his subject is evident throughout the DVD's duration. Extra features include a gallery of spoons from around the world. This DVD comes highly recommended by Woodcarving.